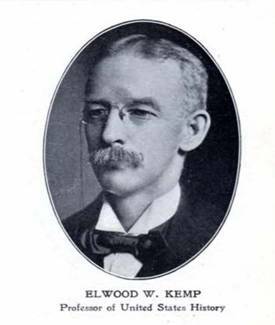 Elwood W. Kemp was both student and professor at Indiana State Normal School. While not much is known about Kemp’s personal life or life outside ISNS, it is abundantly clear that he was a passionate instructor who inspired several generations of Indiana schoolteachers. He was also very loyal to his alma mater, and played an important role in helping the institution survive, grow, and flourish during his long tenure. As one of the earliest graduates of the new Indiana State Normal School, Kemp, along with five other men and ten women, received his teaching credentials in 1880. He specialized in American history, a subject long near to his heart. The esteem of his classmates is reflected in his election as the representative of the Class of 1880. Interestingly, he evidently did not stray far from Terre Haute following graduation (though he noted at a reunion many years later that several classmates had gone on to destinations like California and New York), since he reprised his speaking role at commencement in 1881. At those exercises, Kemp reportedly stole the show by proposing a satirical toast to “The Normal School Yard,” in which he aimed mock admiration at the ISNS grounds, which had remained conspicuously unimproved since the school’s opening in 1870. Nevertheless, his affection for the insitution was borne out by his eventual decision to teach there himself. In 1882, William Wood Parsons was made the head of the History Department, as well as the head of Grammar and Composition. Parsons gave Kemp his first shot at teaching by passing along to him some of his own teaching duties for the 1882-1883 academic year. It seems that between 1883 and 1886, however, Kemp found little or no work at ISNS. But his prospects improved in 1886, when Agnes F. Reynolds resigned as acting professor of history at the end of the fall semester. Kemp was elected by the other professors to carry out Reynolds’ duties for the remainder of the year. This temporary post eventually turned into a permanent one, though, as he was made a full professor himself just two years later—a testament, apparently, to his advanced teaching skills. Kemp served as a full professor of history from 1888 to 1914, with an emphasis on American history and history research methods. In 1897, he authored a highly influential textbook entitled An Outline of Method in History, which was the standard work on the subject for many years across the country. Many of the chapters in his book, such as “The Nature of History,” “The Relation of Geography to the Movement of History,” and “The Forms into Which History Takes” were more widely disseminated as articles in scholarly journals. Kemp was also a featured contributor to the school yearbook, The Normal Advance, in 1896 and 1898. It is clear that Kemp was very interested in history methodologies. In his synthesis of the history of Indiana State Teachers’ College, William Lynch noted that Kemp stood out in the History Department because he not only instructed ISNS students in how best to teach history, but also required those same students to read history in earnest, as well as to try to “re-live” history in various ways. This may seem odd to modern readers, but it was an important distinction at a time when few Normal school classes strayed from purely methodological and theoretical concerns. Lynch also remarked that Kemp never seemed completely happy teaching at a Normal school, partly because he had always desired to teach at the grade school level. According to one of his former students and colleagues, Kemp paid less and less attention in later years to anything that had previously characterized his work—another indication, perhaps, with an underlying sense of professional restlessness. In 1910, only eight professors remained at Indiana State Normal School who had been there since the early days in the 1880’s; one of them was Elwood Kemp. While it is not exactly clear when Kemp assumed a leadership role in the department, it was probably no earlier than 1908, since the first publication to list him as Chair dates from the spring of 1909. Kemp took a leave of absence from ISNS from 1913-1914, immediately followed by his resignation. While the available sources do not say exactly why he left, failing health seems as likely a reason as any, as he was probably in his fifties by this time. In any case, his professional record bears witness to a dedicated scholar and teacher who dedicated at least thirty-seven years to the Indiana State Normal School. Lynch, William O. A History of Indiana State Teachers College. Terre Haute: Indiana State Teachers College, 1929. The Normal Advance. Volume II (1897). Indiana State University Archives. The Normal Advance. Volume VIII (1898). Indiana State University Archives. The Normal Advance. Volume XIV (1909). Indiana State University Archives. Outline of Method in History. 1897. History for Graded and District Schools. Boston: Ginn, 1902. “Great Men in History.” The Normal Advance. Volume II (1896). Indiana State University Archives. “Culture and Its Purposes.” The Normal Advance. Volume VIII (1898). Indiana State University Archives.